When will be Dino Dana next episode air date? Is Dino Dana renewed or cancelled? Where to countdown Dino Dana air dates? Is Dino Dana worth watching? 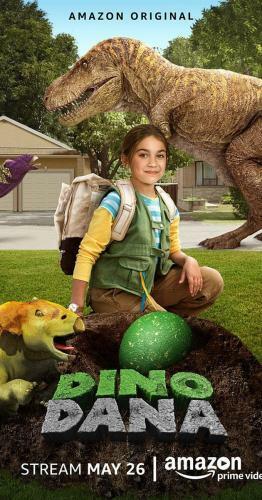 Dana's dino experiment goes awry when she finds an abandoned baby Triceratops and tries to reunite it with its family. When Uncle Ravi comes over for a curry cook-out Dana must protect Dad's special ingredient, a spicy mirchi pepper, from being eaten by hungry herbivores! Dana conducts Dino Experiment 618: What does it feel like to go as fast as a Compsognathus, the fastest dinosaur? With her Compsognathus skateboard she's ready to feel the speed, but first she must master the basics of skateboarding. Dana uses a trip to the grocery store with Grandma to conduct Dino Experiment 621: What did the Sygimoloch use the Spikes on its head for? While Dad helps Saara practice karate, Dana studies which carnivore can get past the sturdy armour of the Euoplocephalus. Smitten with Cai's new foster kitten, Dana tries to convince Cai to adopt the kitten while imaging what it would've been like for cave-people domesticating a Smilodon. When Grandma watches over Dana, Dana's disappointed because she and Dad planned to transform her bike into a Dromaeosaurus for Dino Experiment 612: How does a Psittacosaurus use its tail quills to protect itself. Dana comes across a herd of traveling sauropods and learns about why and how they migrate. Using what she learns she helps Mr. Hendrickson's move into a new home a little easier. Dana and her family plan to have a picnic lunch, but find their picnic basket has been slashed. The family heads to Dino Court, to try "The Case of the Picnic Basket Slasher". Ms. Currie asks Dana to help her choose a reptile that's most like a dinosaur to adopt for Trek's upcoming birthday. Together they scour the local Reptile Zoo and pet store for the perfect pet. Dana neglects to do her part to help take care of Nixon because she's too preoccupied with Dino Experiment 620: How do Edmontosaurus take care of their babies. At Grandma's farm Dana conducts Dino Experiment 625: What does it feel like to ride a Hippodraco? With Grandma's guidance and Saara's love of horses, they help Dana learn what it feels like to ride a "Horse Dragon". Dana wants to stay up all night to do Dino Experiment 623: Are there nocturnal dinosaurs? But her Dad's just come back from a late hospital shift and wants to go to bed. Dana uses her time at Grandma's farm to conduct Dino Experiment 615: Who would win in a fight? A Triceratops, Diabloceratops, or Kosmoceratops? Dana, Grandma and Saara all get invested and choose a dino to root for. Dana discovers the differences between dino and human babies a when Mom's friend Ashley and her new baby Ben stop by for a visit. When Dana, Saara and Uncle Ravi go gokarting together, Dana learns helpful techniques from a nearby Stygimoloch to help as they race each other. Dana is doing Dino Experiment 624: Why does the baby Brachiosaurus eat so much? Meanwhile, Saara adeals with her very first face pimple, an early sign of growing up. Dana has a nightmare where Saara's a Super Villain who steals an Ozraptor bone from a special, traveling display at the ROM. Dana learns that male Dromaeosaurus give gifts to impress female Dromaeosaurus, just like Dana's Dad did to try and impress young Dana. Dana's at the museum studying Mammoth fossils when she tells Dad and Saara a fantastical story about the cave people that lived among them. Dana and Saara are shoveling the driveway when Dana is distracted by a Troodon who has dug a den under her tree house. Dana wants to figure out why the Troodon dug the dens, but also promised to help Mom shovel the driveaway. Dana accidentally lures a Smilodon into her house, but when mom tells her wiild animals aren't allowed inside Dana uses Nixon as bate to lure the Smilodon outside before Mom and Saara notice. Dana conducts Dino Experiment 608: How Do Dinosaurs Survive the Winter? With some holiday help from Ms. Currie and her grandsons, she discovers some surprising results. In this two-part special, Dana creates an elaborate board game called the Game of Bones that brings out the competitive side of her family as she explains what happened when a meteorite ended the reign of the dinosaurs. Dino Dana next episode air date provides TVMaze for you. EpisoDate.com is your TV show guide to Countdown Dino Dana Episode Air Dates and to stay in touch with Dino Dana next episode Air Date and your others favorite TV Shows. Add the shows you like to a "Watchlist" and let the site take it from there.